In economics, Elasticity of demand is an important concept of demand. Demand can be segregated between elastic, inelastic or unitary demand. An elasticity of demand refers to the degree which supply and demand respond to a change in another factor, such as price, income level or substitute availability etc. Inelasticity of demand can be simplified as the change in one or more than one determinant may have a little or no change in the demand of the product. Elastic demand means a substantial change in quantity demanded when the price of the commodity gets changed (either reduced or increased). The demand for a product is considered price elastic whenever the ratio of percentage change of demand divided by the percentage change in price is greater than one. A demand of the product depends upon the price of a good, income (purchasing power) of the buyer, price of related goods, tastes, and preferences of the buyer and these are called determinant of demand. Demand happens to be elastic for luxurious commodities due to an infrequent purchase of these commodities. When the prices of the commodity increases, the demand for the quantity will decreases because people will not willing to spend more money on this product. At the same time, when the price of the commodity decreases, the demand will increase. Here, the Price factor will lead to the quantity of consumption of the commodity or consumption of other available substitutes in the market to be decreased or increased. In term of revenues, increase prices of the commodity will decrease the demand which will lead to a decrease in revenues and vice-versa. 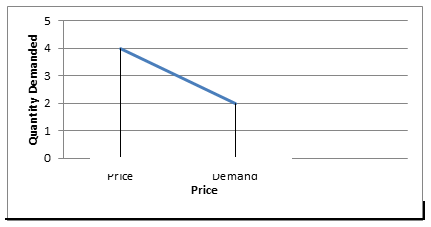 Graphically, Elasticity of demand is represented by price and quantity demanded. Inelastic demand, Quantity demanded fluctuation is more with respect to the change in price. When prices of the commodity will increase, the demand will decrease and vice-versa. A more elastic curve will be horizontal. Inelastic demand means the slight or no change in quantity demanded when the price of the commodity gets changed (either reduced or increased). percentage change in price. 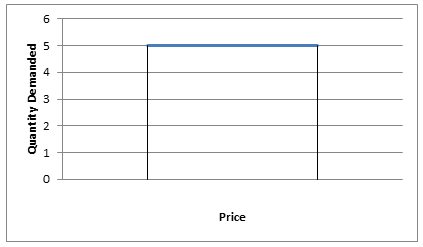 The demand for a product is considered price elastic whenever the ratio of percentage change of demand divided by percentage change in price is less than one. Here, Demand determinants impact will be low or negligible due to the nature of consumption. Demand for necessity commodities is inelastic due to a frequent purchase of these commodities for basic need by the consumer. The demand of quantity will not get much affected much by the decrease or increase in the price of these commodities. i.e shops, food grains, oil, petrol etc. An inelastic demand of the commodity will not lead the more changes in the revenues due to the stable demand of the commodity. Graphically, Inelastic demand, Quantity demand fluctuation will be negligible or no with respect the change in price. A more elastic curve will be Vertical. Relatively more elastic: Elasticity coefficient is more than 1. Relatively less elastic: Elasticity coefficient is less than 1. Unitary elasticity: Elasticity coefficient is equal to 1. Perfectly inelastic: Elasticity coefficient is zero. Elastic demand means a significant change in quantity demanded when the small price gets changed (Either reduced or increased) and inelastic demand means, a small change in quantity demanded when the small price gets changed (Either reduced or increased). An elasticity of demand can be calculated as Elastic demand means percentage change in the quantity of demand is more than 1 with respect to the percentage change in price and inelastic demand means percentage change in a quantity of demand is less than 1 with respect to the percentage change in price. In a graphical presentation, the Elastic demand curve will be shallow and inelastic demand curve will be steep. Inelastic demand, demand determinates will impact the demand of the commodity but in inelastic demand, demand determinants will have negligible or no impact on the demand of the product. Luxurious commodities have elastic demand and necessity commodities have inelastic demand. Inelastic demand, when prices increase revenues decreases and vice-versa. However, in inelastic demand, revenue will not get much impacted by the price. Inelastic demand, products or commodities are more prices sensitive, whereas, in inelastic demand, products or commodities are fewer prices sensitive. Meaning Elastic demand means a significant change in quantity demanded when the small price gets changed (Either reduced or increased) Inelastic demand means, small or no change in quantity demanded when the small price gets changed (Either reduced or increased). Availability of substitute Substitute for the product will be available. Less or no substitute available. An elasticity of demand plays a major role to determine the demand of the product/commodity with respect to the change in price. The commodity with more substitutes will have elastic demand due shifting of a customer from one product to another and commodity with no or fewer substitutes will have inelastic demand due to unavailability of option for the consumer. Necessary commodities always have superior demand due to the spending nature of consumers because the consumer spends a major portion of their income in necessary commodities.